Being stressed – just about one of the commonest words we use today to describe ourselves and how we feel. We tend to for the most part shrug our shoulders, make a feigned joke about it and drink yet another cup of coffee, accepting it is part of life, but not really knowing just how much it is affecting us. But it is affecting us, often in rather slow insidious ways. 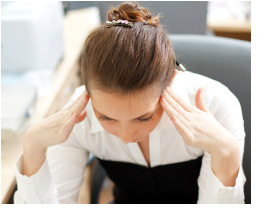 In fact stress is one of the commonest complaints patients bring to Practitioners. Physical stress – lack of good quality sleep, excessive exercise without proper rest, bio-mechanical strain due to poor posture / injuries, etc. Bio-Chemical stress – from poor diet, poor eating habits, environmental pollutants allergies, hormonal imbalances etc. In fact stress is actually anything which disrupts our bodies normal homeostasis (balance), which is very important as to be healthy one needs to maintain ideal homeostasis. Illnesses will occur where the homeostatic balance has shifted to a new more precarious ‘balance’. The body deals with stress in a number of ways, primarily via the ‘sympathetic’ branch of our autonomic nervous system, which in turn affects our endocrine (hormonal) system, particularly our adrenal glands, which then has disruptive effects on the rest of our body’s functions. Short infrequent periods of stress are of course inevitable and indeed are what our adrenals were designed for (producing the ‘fight or flight’ response via the hormone adrenaline) enabling us to survive major life threatening events. It is because of the ‘fight or flight’ response of adrenaline that there is a close association between the adrenals and our blood sugar levels. During a ‘fight or flight’ (stress) situation, we need instant energy, and so the release of adrenaline causes the conversion of stored glycogen (in the liver) into glucose, thus rapidly raising our blood sugar to very high levels. It is of course the prolonged / frequent stress events, which are part of modern life and indeed are now contributing to poor health and early demise. According to Professor. Hans Selye (the world’s leading stress expert) our bodies response to long term stress progresses in the following stages, known as the General Adaptation Syndrome (G.A.S.). Increased consumption of stimulants, coffee, colas/fizzy drinks, cigarettes, alcohol, chocolate, cakes, etc. Desire to sleep during the afternoon along with increased energy at night. Decreased libido without necessarily having a headache! If you at stage 2 or 3, first and most importantly, recognise you cannot carry on like the above indefinitely without serious health consequences, so put yourself first for a change! Seek help from a Nutritional/Kinesiology practitioner for the physical or metabolic problems which are beyond your control. Follow whatever nutritional advise is recommended including supplementation and Kinesiology exercises aimed at regenerating/supporting the adrenals. If you reach stage 3 and do not deal with the cause and effects of stress, it can lead to more serious health problems, as well as premature ageing, so it is wise to take action, the earlier the better. Sean Kulyk is an experienced and well qualified Natural Medicine Lecturer and Practitioner with 18 years clinical experience, specialising primarily in Applied Kinesiology, Naturopathy, Homoeopathy, Reflexology and Spinal Touch. Sean is a firm believer in the Holistic approach and the need to involve the patient in their healing process via nutritional improvements, homoeopathic remedies, stress release techniques (including deep breathing and Kinesiology self help exercises), along with other lifestyle adjustments.